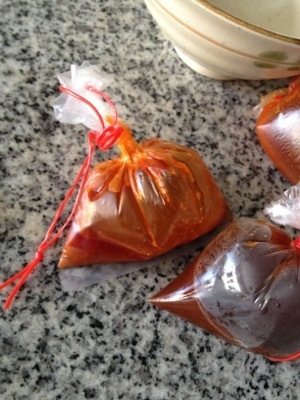 You know those little packets of ground chilli in oil that you get from buying and taking away yong tau hu, fried noodles and the like? Here’s a simple way to reduce the amount of oil. 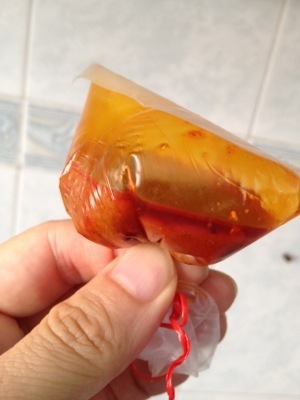 First, before you open the packet, tip it upside down and let the oil do what it likes to do – float to the top. Now untie and open the packet upside down – and let the chilli pour out. But stop the flow when you’ve had enough and leave most of the top oil in the bag. 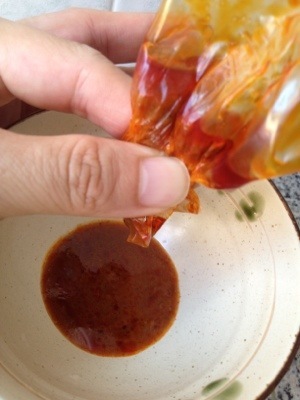 There’s no way to avoid some oil coming out since it is used for suspension in the sauce. But at least you saved yourself from most of it. 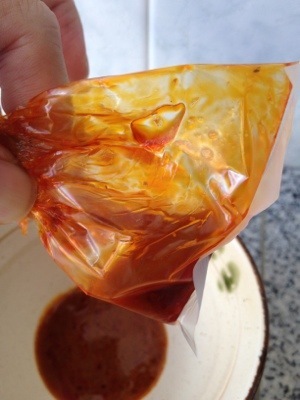 Now glare with disgust at the remaining oil in the bag. You’re done. A peek into the vegetable chiller compartment of my fridge. What you see – strawberries, cherry tomatoes, lettuce, dried cranberries, blueberries… essentially, is all mine. Over the course of the last few months I’ve gradually taken over the drawer of the chiller. I think my wife hasn’t realized it yet. Strawberries. My original breakfast cereal staple. First Breakfast became a much fresher concept when I realized that strawberries added a burst of sparkle to the taste. Strawberries used to be the Fruit That I Did Not Know What To Do With, because it was too small, too expensive and I am not a baker. Also, strawberries across the modern ages has had its reputation spoiled by such artificialities as strawberry jam, strawberry ice cream/yoghurt and strawberry candy – all of which have successfully fooled generations of people that strawberry is supposed to be inordinately sweet. It is not, that’s just the sugar talking. I grew up thinking strawberries are classified as “sweet fruits”. You know, like mango and oranges. Until I ate a real one. OK to be fair, if you know how to choose (I’m still learning) and pay enough, you can have sweet – make that mildly, reasonably – sweet strawberries, like these Korean strawberries. I’m not going to ask anyone if these are genetically modified or generously fertilizer-ed. All I know is, over the last 3 or 4 months I’ve been buying strawberries almost weekly, and between Australian, New Zealand and Korean strawberries so far, the latter are consistently the sweeter ones. In any case, for the last month they seem to be the only ones in season. Don’t ask me about Japanese strawberries though. I can’t afford them. Indeed, price has always been an issue. For me, in Singapore, a bag of fruits is considered reasonable if it’s $2. I buy five American Gala apples for $2 at your typical supermarket. Strawberries tend to start at the $4 end for a box, which typically contains about 15 to 18 strawberries. It’s not, to me anyway, a cheap investment, especially since they do spoil faster, even in the chiller. I’ve learnt that you should be careful buying strawberries that are on sale. These are at the end of the their shelf life and are liable to spoil within a few days in the chiller. Sometimes however, fresh strawberries really are on sale at a discount, so the trick is to visually check before you buy. Brightly coloured (reds and greens) strawberries good; wilted leaves bad. Speaking of appearance, I read that strawberries really ought to be red, and those with whitish parts aren’t as good. This seems to be true, going by my buying and tasting experience so far. Another thing – I used to think strawberries, as depicted on gift cards and cutesy stationary – ought to be pointed and heart-shaped. Until my friend told me the really good ones are the ones shaped like feet – as in, splayed out at the end, not pointed. Mould – in my own observations, strawberries seem to develop mould if they are kept in the same position in the box too long. So, after a day or two, I would usually remove the bubblewrap used to protect the berries during transit, and jiggle the box to reposition them in the box. 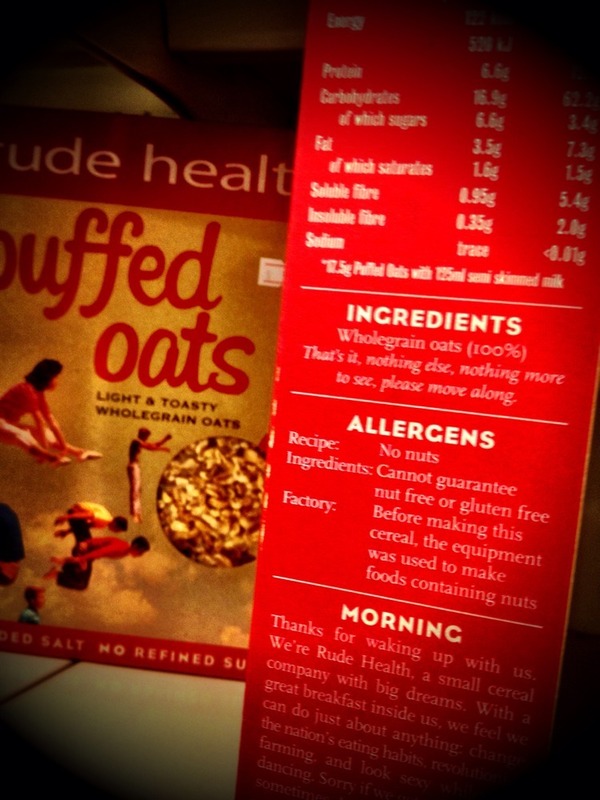 Diet food is often characterized by very short ingredient lists. My wife borrows many cookbooks, and ever since I started on this weight loss programme, she’s found many a low carb cookbook. One night I opened up one for a look and it was pretty educational. On a whim I took a few snapshots, including this one. Alas now I can’t remember what book it is! EDIT: It’s The Low Carb Cookbook by Amanda Cross. Of particular interest is the notion that eating after 8pm is bad – is a myth. What do you think?